The idea of what is “fun” for children is constantly changing. Let’s face it – when faced with the toys that provided us with endless entertainment when we were young, our kids would most likely roll their eyes and walk away! To track how play time has really changed in the last 35 years, however, you needn’t look any further than the modern day playground. Remember running out of the classroom to the playground, trying to be the first to arrive? Gone are the days of taking a spill and getting a fresh knee scrape from the harsh blacktop. Playgrounds now offer varied surfaces, from rubber tops to wood chips, offering less of an impact for those inevitable play time falls. Who could ever forget the sting of a ride down a metal slide that has been roasting under the sun on a hot day? Some of these steep slides even neglected to include side rails! 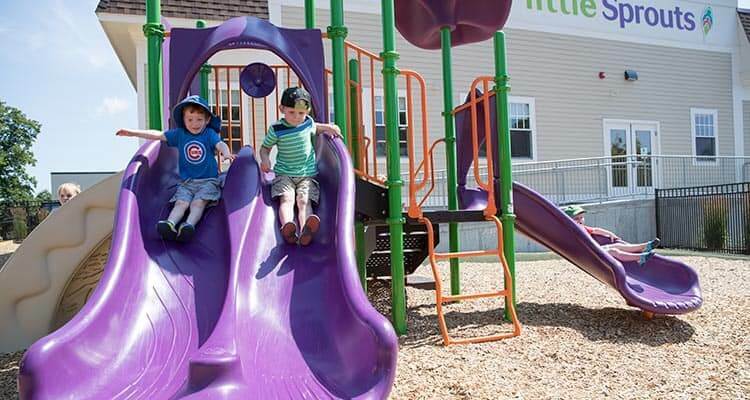 Today, metal slides have been replaced with molded plastic, allowing kids to enjoy them without having to consider the temperature. Tall, metal, imposing jungle gyms in the 1980s and 1990s offered callused hands and thrilling views atop the playground for adventurous climbers. Today, these structures have largely been replaced by rope and conventional ladder features attached to a main unit that offers a slide as a safe and fun trip back to solid ground. Teeter-totters, or see-saws, were another fun playground excursion overdue for an overhaul. Often constructed out of splinter-filled wood or rusting metal, they often reached heights taller than the very children they were designed for, making climbing on and dismounting them tricky to accomplish without injury. Nowadays, see-saws are designed in a multitude of clever and unique ways, all which offer the fun without the risk. A true relic of playground history, the merry-go-round is not often seen in modern day playgrounds, which may be for the best. Made of metal and able to spin at dizzying speeds, the end result of spinning with friends on a merry-go-round was often simply falling off. Current versions of the merry-go-round are now made of plastic, and are often weighted down in order to restrict the spinning speeds. The biggest change, of course, is our children are simply much safer now when enjoying an afternoon full of fun, imagination and adventure on the playground – and that is what’s most important! What are your favorite memories of exploring the playgrounds from yesteryear? Be sure to let us know in the comments below!